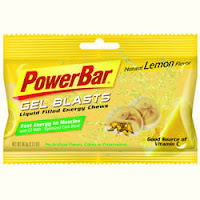 Back in August when I walking around the vendor stalls at the Nike Human Race at the Colisium, Powerbar was there handing out these Gel Blasts and Fruit Smoothie Bars. I one I picked up was Natural Lemon flavored but it also comes in Natural Cola. The Smoothie Bars come in Berry Blast (the sample I got), Creamy Citrus and Tangy Tropical. I took the Gel Blasts out to a long run one weekend to "road test" them. Wow, after running many miles these were so good! They taste like sweet and salty gummy bears and when you bit the center, a refreshing lemon goo comes out. It says that 6 of these is equal to 1 gel. Let me tell you that I would rather eat these than gels. I even started eating these just for fun as they were yummy even when not training. Not really a good idea as 9 pieces (1 pack) packs 190 calories. The Berry Blast Smooth Bar was ok. 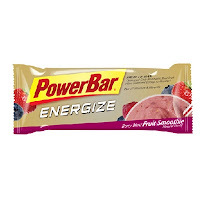 Same consistency and texture as regular Powerbars but more of the fruit rollup sort of flavor. Kinda leaves a cherry cough drop aftertaste...weird. It's still sticky and really chewy like regular Powerbars which is why I don't really like them. Overall, I would eat them again if they were in front of me but I would go to seek them out. These have 210 calories, 3.5 g of fat and 6g of protein.